Stuff to Click On - Nov 2010. An example? Here, look at this article on the Huffington Post. 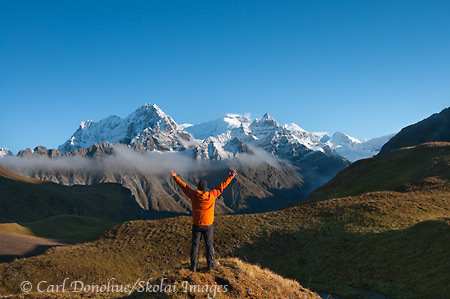 The title of that page is “21 Insanely Gorgeous Valleys Around The World (PHOTOS)”. How about “21 Insanely Mediocre Photos”? We kind of expect this from the news media, I suppose, as they strive to sell advertisements. But friends on Twitter, Facebook, etc, etc .. let’s not stoop to that. You love it, post it and say so. If not, don’t regurgitate drivel. Take a LOT of Photos. Chase Jarvis is a good photographer, and a great blogger. This article, inspired by a great book, “Art and Fear”, is a good read for any serious photographer. As is the book, Art and Fear; Check it out. And add Chase’s blog to your RSS Feed or newsreader. Nikon Gear Guides. Here’s a nice new addition; Nikon USA have a new section of their pro-website; “Technical guides that cover practical know-how and usage tips for professional photographers who use Nikon cameras, NIKKOR lenses and accessories”. This info is NOT in their manuals, and is much more relevant and helpful. Technical Solutions. Quite the Climbers. Take a look at this mountain goat, in Joel Sartore’s photo, published in National Geographic magazine’s recent article on migrations. It should be photo #8 in the thumbnails. Now THAT’S some serious climbing action. No ropes. Joel Sartore Interiew. Nature Photographers Network Editor-in-Chief Richard Bernabe interviews National Geographic photographer Joel Sartore. They discuss various nature photography subjects, but focus on Joel’s latest project, a book called “Rare: Portraits of America’s Endangered Species”. “Let’s save endangered species simply because we care … Do we want to save species and habitats, or do we want to simply pave over and sterilize as much as we can in the name of economics?” Joel’s a great photographer, and this interview is a nice read. Wolverine – Chasing the Phantom. A PBS special documentary on the mythical Wolverine. the entire rogram is available online. “A wolverine patrols an area about 500 sq miles”. That’s an enormous home range. “This episode of NATURE takes viewers into the secretive world of the largest and least known member of the weasel family, revealing it to be one of the most efficient and resourceful carnivores on Earth”. Life Unseen: Images of Magnificent Microscopic Landscapes Check out this year’s winning micro-imaging entries from the Olympus BioScapes Digital Imaging Contest. Some simply amazing photographs. Slideshow. Crocodiles and elephants. A crocodile leaps from the water and grabs … wait for it …. an elephant’s trunk. A tug-of-war follows. Zambia’s South Luangwa National Park. Here are the Winners! ….. of the 2010 National Wildlife Federation Photo Contest, that is. Take a look over the winning photos from this contest, some amazing images here. David Mitchell’s shot from the Alabama coast in the gulf oil mess is incredible. More amazing images. Photos entered into the still to be decided National Geographic Photo Contest. Deadline = Nov 30. A selection of 47 of those images posted online at the Boston Globe. Nature Photographers Head to Bosque. Naturescapes Photography Series: Bosque del Apache, New Mexico. Join Greg Downing, along with Deborah Sandidge and Tim Grey for a nature photography extravaganza this December, at Bosque del Apache, New Mexico. That’s gotta be a blast to attend. Banff Film Festival. .. and the winner is ….. Mi Chacra! The film, by Jason Burlage, follows “a young indigenous Peruvian man (Feliciano) who has lived his entire life, but for a few brief months, in a small farming village in the mountains above the Sacred Valley. .. Framed by the seasons, the film chronicles a year in the young man’s life, from planting to the harvest, and through a season of work as a porter on the Inca Trail.” 3 other winners from the Banff Film Festival include Eastern Rises (a fishing adventure and misadventure in Kamchatka, Russia) Crossing the Ditch (Aussie kayakers attempt to paddle the Tasman Sea) and A Life Ascending (documentary film about mountain guide Ruedi Beglinger). Fire up your Netflix list! Earth as Art. Some very cool Landsat images from the U.S. Geological Survey; a colorful and striking portrait of the Earth’s land and sea surfaces as seen from space. Uh Oh! Apparently Facebooking, low self-esteem and narcissism are linked. “Soraya Mehdizadeh .. discovered narcissists and people with lower self-esteem were more likely to spend more than an hour a day on Facebook and were more prone to post self-promotional photos ….” Ouch!!! Scientific American article. What Happened to Downtime? A nice article by Scott Belsky on the pervasive, indeed invasive, nature of modern technology, and what it means for our ‘sacred space’, distraction free time. Scott offers a cursory examination of where this kind of incessant influx of media might lead us, as well as a way to power off and listen to ourselves. Excellent article and advice for those interested in creativity (and who wouldn’t be?). Quote #2: “Writing songs is like capturing birds w/o killing them. Sometimes you end up with nothing but a mouthful of feathers.” – Tom Waits. The Creative Pause. Linked from Scott’s article above, this piece by Cameron Moll, titled Why thinking in the shower may be an ideal model for “creative pause” is itself worthy of note. “Let’s be honest: Who doesn’t profit from thinking in the shower?” Cameron’s discussion in this article is 100% on the money, in my experience anyway. “How do you achieve creative pause?” is an excellent question. Give it some time. Biking as Art. Sometimes a piece of art just stands out and stays with me. Check out Danny MacSkill, a near-legend on a bicycle. Treat yourself well – load up the full-screen version of this HD version of Danny’s latest video, turn up the sound, and enjoy some magic. Danny’s a legend, and this may be his best video yet. The music, the photography; the whole thing is just fantastic; the riding is absolutely extraordinary. This is awesome. 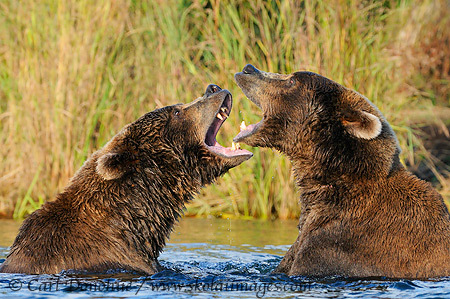 2 young grizzly bear adults play fighting in a river, Katmai National Park and Preserve, Alaska. Are Polar Bears More Than Threatened? New research suggests polar bears will adapt to climate changes and find new food sources, rather than face imminent starvation and extirpation. “Climate change driven advances in the date of sea ice breakup will increasingly lead to a loss of spring polar bear foraging opportunities on ringed seal pups creating a phenological trophic ‘mismatch’. However, the same shift will lead to a new ‘match’ between polar bears and ground nesting birds.” The published report is here. At the same time the US F&WS announced the final ruling for polar bear critical habitat …“geographic areas containing features considered essential for the conservation of the bear that require special management or protection.” The listing includes nearly 190 000 sq miles. A Gaggle of Scientists Gather. ” … hundreds of members of the American Geophysical Union are forming a rapid-response team aiming to challenge disinformation and misinformation deployed in the policy wars over global warming.” One wonders, of course, what took so long. Andrew Revkin’s DOT Earth column is always a good read. He discusses this issue at length, including snippets of interviews and responses from some of the scientists involved. Bluefin Tuna and the Free Market. Argue for a ‘free market’? Browse this report. This is what happens when oversight is missing. A 7 month long investigation shows ” …. the system failed at every point. It failed in that vessels were overfishing and that officials were turning a blind eye to that overfishing for years.” Populations of Atlantic tuna, which is prized for sushi, have dropped by 75 percent over the last four decades, with half of that loss happening between 1997 and 2007, according ICCAT data”. As a follow up to this, unfortunately, “France, Spain and other Mediterranean nations forced the European Union to retreat Thursday from an ambitious plan to save the threatened and prized bluefin tuna.” EU retreat. Killed – 100 Tigers Each Year. A frightening report on the illegal trade in tiger parts. Excuse me? WTF is a “tiger part”? This study suggests as many as 1200 tigers slaughtered purely to supply folks with “tiger parts”. Horrific stuff. “A century ago there were around 100,000 wild Tigers; today the figure is believed to be as few as 3,200.” Read Traffic International’s press release here. On the upside, those same folks trading ‘tiger parts’ had a meeting and “officials from 13 nations agreed Tuesday on a program to double the population of the big cat by 2022, the next Year of the Tiger under the Chinese zodiac”. Article. Bird Beak Deformities. USGS scientists publish a Press Release suggesting an epidemic, called “avian keratin disorder”, in some Pacific Northwest and Alaska bird populations. The exact cause is unknown, but the issue could well suggest a wider environmental problem. The studies yielded the highest rate ever recorded in wild bird populations of beak abnormalities. “We’re seeing ecologically unique species affected across a wide range of habitats. The scope of this problem raises concern about environmental factors in the region”. The published reports can be found here: Beak Deformities in Northwestern Crows and Widespread Beak Deformities in Resident Species. Quote #3: “The line between use and misuse, between objectification and celebration, is fine indeed.” – Gary Snyder, “Practice of the Wild”. I must thank you for this post and the one from last month, both of which I actually read. However, as much as I yearned to in a few cases, I refrained from clicking on anything you mentioned. Think of the time I saved. You give a great summary of each cool item to the point that I don’t really need to click on any of them. I realize this may not have been your purpose for this post, but I feel it is a great alternative approach to it. You are providing a great service. I also had a few chuckles and patted myself on the back for not being on Twitter or Facebook yet. Notice I do say yet, meaning I do plan to try it some day when I can afford to be inundated by that much extra distracting information.